There’s more to bird watching than watching birds. Attempting to bird by eye alone is like driving home with only half your gears: even if you get where you’re going, the trip is going to take a lot more time than it has to. Knowledge of bird song makes birding more complete. It also makes the endeavor more enjoyable. After all, it’s not like we’re talking about frogs croaking here. Whether you’re in the mood for sublime, evocative, or even downright weird, there’s a bird out there playing your song. Lang Elliott is intimately acquainted with the amazing depth and breadth of the avian orchestra. Elliott, renowned for his recordings of a veritable symphony of nature sounds, has authored or collaborated on a library shelf’s worth of book/CD packages. Birds are his specialty, and in The Songs of Wild Birds, he shows us why. This book, paired with the inevitable companion audio CD, describes more than fifty North American birds through an integrated array of brilliant photographs, insightful essays, and vivid song. 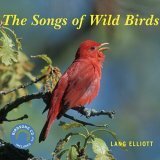 The Songs of Wild Birds is not a primer on the songs of the fifty most common or widespread American birds. He already wrote that book. Nor is it a celebration of bird song, a field guide of bird songs, or even a compendium of the cool, creepy sounds of night. Instead, this book was organized on the concept that one of the world’s leading experts on North American bird song, an individual who has assiduously studied avian utterances from coast to coast, has selected the species whose vocalizations he finds most noteworthy, most interesting to share and discuss. Sounds cool, right? Trust me, it is. Mr. Elliott’s all-star lineup kicks off with the Common Loon. We are treated to an arresting photo of a loon in its striking breeding plumage along with a brief essay describing the bird’s yodel, wail, hoot, and tremolo. The attending sonogram of the loon’s peculiar calls is all that distinguishes this offering from an ocean of other articles on the Common Loon. At least, that is, until you listen to the first track of the companion CD. At the sound of that unmistakably eerie cry and Elliott’s expert insight, it becomes clear that The Songs of Wild Birds is a multimedia treat. A couple of tracks later booms the distinctive thunderpump of the American Bittern, not a song by any stretch of the imagination but most assuredly a sound (and a bird) worthy of discussion. Elliott expounds upon the delicate flutes of thrushes, the hoots of owls, and the spare chips and buzzes of grassland sparrows. He analyzes the calls of eastern Empidonax flycatchers side by side and contrasts the song of the Eastern Meadowlark with that of its Western kin. At last, I know what pee-a-wee and whip-poor-will are supposed to sound like. At last, I can, if pressed, declare a favorite avian vocalist. Long live the tiny, tinkling Winter Wren! Mr. Elliott’s eclectic selections and accompanying recordings are what make this book special. As a birder with an embarrassingly uninformed ear, I found The Songs of Wild Birds both instructive and enjoyable. Birders with a better grasp of bird song may not be as interested. Furthermore, the only way to experience this book to full effect is to listen to a track while perusing the matched photo and essay. Each component may stand alone on its own merits, but the success of this book comes from the sensory synergies mined by the collaboration of written, visual, and audio impressions. What I’m trying to say here is that if you are going to read this book, do it right. A couple of hours committed to looking, listening, and learning with this appealing book will be considered time well spent. Thanks, Charlie. I have to try harder to make up for the quality of my photos! Mike I just finished reading “Bird Song” by Don Stap. If you haven’t already you should give it a try. Until I read it I had no idea just how complex bird song is. Differing dialects, differnt songs, how and when birds learn song, and how we are just learning that some sub-oscines, long thought to have only instinctual songs (as opposed to learned) also learn songs – something that may be tied to those species breeding behaviour. Incredibly complex and incredibly fascinating. I was also reminded about the first time I heard an American Bittern’s song. I was snorkling at a lake in the Duck Mountains and had no idea what was making that incredible sound. I swam over and with just my face sticking out of the water had the most amazing experience watching him sing. The song of the Winter Wren is awesome. You can’t beat that much sound coming from such a tiny bird. Thanks for the recommendation, Clare! Can anyone tell me where I can get a cd of a bullfinch in song, either british or siberian would do.